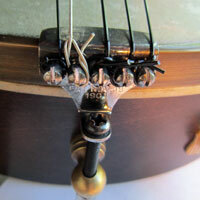 The no-know tailpiece is a popular choice for open-back banjos, and it's been in use for more than 100 years. As the name implies, the strings can be attached without tying knots. Or, if you prefer, you can attach the strings by using knots, as shown here. The BB Tailpiece is my own design. They are cast bronze and have a nice floral pattern with the letters BB. This tailpiece adds a bit more tension to the head, compared to a no-know- which in turn gives the banjo a bit more punch. A nice touch is that this tailpiece is attached with a regular rim hook.